The Atwater Book Club meets to discuss their selection of the month. Please call the library at 323-664-1353 to find out the current title. Hear and sing beautiful songs for kids! All ages welcome. STAR - Books come alive for kids when they share the fun of reading with STAR library volunteers. Call the library for a complete schedule at 323- 664-1353. Computer Comfort - Beginning, hands-on training on the computer keyboard, the mouse, the execution of a search, and the understanding and interpreting of information on the computer screen. Various Saturdays. For exact dates call (323) 664-1353. 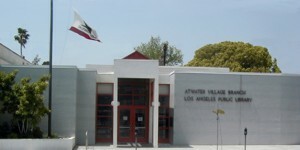 Atwater Village is located in the Thirteenth District, represented by Councilmember Mitch O'Farrell.